There is a lot of Literature on the Subject of Law and In spite of that, different definitions have been given.... Law is a Social Science and grows, develops with the growth and development of Society. New development in Society creates new problems and law is required to deal with those problems In order to keep pace in society, the Definition and scope of law must continue to change. The result is that a definition of law give at a particular time cannot remain valid for all times to come. A definition of Law which is considered satisfactory today may be found narrow tomorrow. Justinian: According To Justinian "Law is the King of all mortal and immortal affairs, which ought to be the chief, the ruler and the leader of the noble and the base and thus the standard of what is just and unjust, the Commander to animals naturally social of what they should do the forbidden of what they Should not. do. Hobbes: According to Hobbes Law is the speech of him who by right commands somewhat to be done or omitted. Classification of laws have been made time to time. For a proper understanding of law, a classification of law is not only desirable but also necessary. Classification of Law makes clear the relation between different rules and their effect on each other. It also helps in arranging them in a concise and systematic manner. It can help a lawyer to understand the law. We must not forget that no classification of law is going to be permanent. Every classification is based on the law as it was when classification made However, law keeps on changing according to the needs of the people at different times and in different places. Law may be broadly divided into two classes International Law and Municipal Law. The term International Law was coined for the first time by Jeremy Bentham in 1780 International Law or Law of Nations deals with rules for the governance of Sovereign States in their relation and conduct towards one another. International Law is not only law but also a very important branch of law. 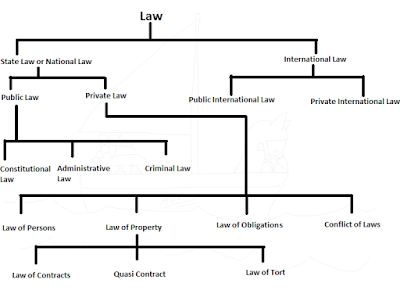 International law is divided into two classes Public International Law and Private International Law. Public International Law is the body of rules which govern the conduct and relations of the States with each other. Private International Law, which is also known as 'Conflict of Laws' deals with cases involving foreign element. In case of a dispute between Individual citizen or State and foreign element, where there is a need to contact with the foreign system of law, the Private International Law will apply. Municipal Law or Law of Nations is the Law applied within a State. 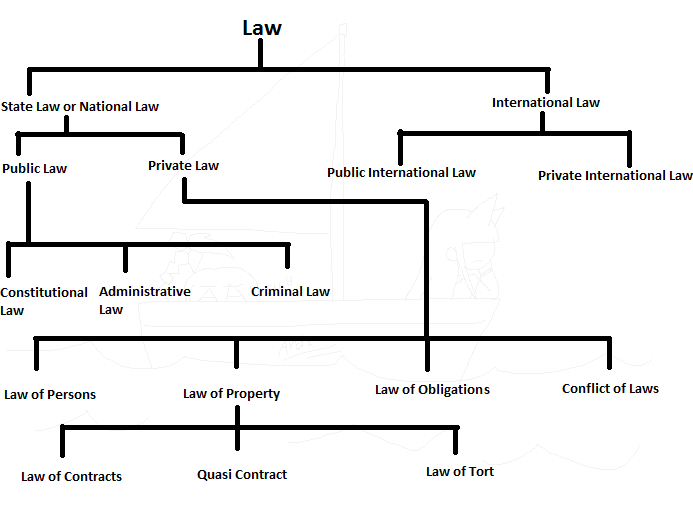 It can be Divided into two classes: Public law and Private Law. Public Law is that branch of Law, which determines and regulates the organization and functioning of the State. It also determines the relation of the State with its Subjects. It is Concerned with the State in its political and Sovereign capacity. The constitutional law determines the nature of the State and the structure of the government. The constitutional law is superior law of the land. In India and United States Constitutional Law is written but In England, it is unwritten. The Modern Tendency is to have written constitutions. Administrative Law deals with the structure, powers, and functions of the organization of administration. Criminal law is necessary for the maintenance of law and order and peace within the state. Criminal law defines and prescribes punishments for them. Criminal Law not only Prevents Crime but also punishes the offenders. Private law protects the Rights of an Individual or groups of individuals. It regulates and governs the relations of citizens with one another. Criminal law or Law of Crimes is the branch of public Law. It deals with offenses punishable by State and is enforced in the name of the State. Criminal Law divided into Substantive law and Procedural Law. Crime is public wrong. It is an offense against the public as a whole. There is no satisfactory definition of the word 'crime'. According to Blackstone "Crime is an act committed or committed in violation of a public law forbidding or commanding it." Civil law is concerned with the rights and duties of Individuals to one another and provides a system of remedies. e.g. Law of Property, Law of Contract etc. The substantive law deals with the rights and duties of Individuals. It defines what facts go to constitute a right or liability. Procedural law is one by which substantive law is applied to particular cases. It provides the mechanism for implementation of the rules enshrined in the substantive law.